J. Allen Herring, 28 years old, a former resident of Fulton, was shot and killed by an unknown assassin at Dallas, Texas, at 12:20 Thursday morning, according to advices received in the city by relatives. Mr.Herring had gone to Dallas the first of January to become foreman of a carpenter crew at work on a large hotel being erected in that city and already had made plans to move his family from St. Louis to Dallas, as it was a long-time contract he was working on. He told his mother in a letter written to her that he liked the town and might make it his permanent residence. No details of the tragedy were obtainable by Fulton relatives of MR. Herring. His brother, Brent Herring, in St. Louis, was merely told by the chief of police of Dallas that his brother had been killed by an unknown person. The body was prepared for shipment and was expected to arrive in St. Louis, Friday. Funeral services will be held there sometime Saturday. Mr. Herring was born and reared in Callaway county. He went to St. Louis about five years ago and followed the occupation of bridge carpenter for a railroad company. He enlisted in the engineering corps of the army during the last war and his detachment was scheduled to go to Siberia but the Armistice was declared before the order came for the movement of the troops. He was discharged from the army last December and since that time had been engaged in the carpenter and contracting work, until his departure for Texas. News of his sudden death came as a distinct shock to his Fulton relatives. In the absence of definite information as to the manner in which he met his death they can only conjecture as to how it happened. One theory would be as good as another and they are waiting either for more details from law officials at Dallas or newspaper accounts of the tragedy. Mr. Herring married a St. Louis woman and besides the widow is survived by two children. He also leaves his parents, Mr. and Mrs. G.W. Herring of Fulton and the following brothers and sisters; Judge D.W. Herring, Woodson, Bob and Jack Herring and Mrs. Mayme Waters, of Fulton; Grover of Detroit; Herbert and Norman Herring and Mrs. Myrtle McCormack of Kansas City, Brent of St. Louis. J. Allen Herring, former Fultonian, who was shot and killed at Dalas, Texas early last Thursday morning, was mistaken for another man according to an investigation made by the Dallas police and which resulted in the arrest of a man named McVey, a member of the Dallas city fire department. McVey is in jail and a charge of murder will be placed against him. He admits that he made a misstake and that he did not even know Herring. The latter was with several former St. Louis people, with whom he had been boarding for six weeks and they were at the Zoo Park in Dallas. As they emerged, McVey shot Herring, the bullet lodging in the back of his ear. The man had hired a taxi and had left his hat in it, which was the clue that resulted in his arrest. Record of marriage, J.A. Herring of Fulton in the county of Callaway and state of Missouri who is over the age of twenty-one years and Tina Lee Dillard of Fulton in the county of Callaway and state of Missouri who is under the age of eighteen years. J.M. Dillard (father of the bride) gives his consent in writing. This is to certify that the undersigned a Minister of the Gospel, G.E. Winter? did at Fulton in said county on the 2nd day of November A.D. 1913 unite in Marriage the above named persons. J.A. Herring and Miss Tina Lee Dillard, both of Fulton, were married Sunday afternoon at the home of the bride's parents, Mr. and Mrs. John Dillard, 211 West Fifth street, the Rev. T.E. Winter, paster of the Fulton Christian church officiating. Mr. Herring is a Fulton carpenter and is a son of Mr. and Mrs. G.W. Herring, south of Fulton. They will make their home for the present with the bride's parents. The young people have many friends in Fulton who wish them a happy married life. Article in the Fulton Telegraph, Feb. 26, 1920, about the murder of J. Allen Herring in Dallas Texas. He was my granduncle. 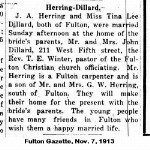 Article in the Fulton Gazette, Nov. 7, 1913, about the marriage of Allen J. Herring and Tina Lee Dillard. He was my granduncle. Two children were mentioned as survivors in the newspaper article about his death. I have not been able to find their names or anything further. Place of death: Oak Cliff Zoo, Dallas. Inquest held Feb. 19, 1920, death occured at 9:00 p.m. cause of death Gun shot wound, homicidal, died within minutes. Bond in the sum of $5,000 was required of Bill McVay, Dallas fireman, who shot and killed A.J. Herring in Forest Park the night of Feb. 18, when he waved examing trial before Justice of the Peace F.H. Alexander yesterday. McVay made a voluntary statement folling his arrest in which he said he had shot Herring, a stranger to him, through a mistake in identity. He has retained no attorney and has not yet made the required bond. Bill McVay, who is under indictment for the killing of A.L. Herring, at Forest Park, Oak CLiff, on the night of Feb. 18, was given a hearing before Judge R.R. Seay yesterday and his bond set at $1,500. After making bond, McVay was released from jail where he had been since a few days after the shooting. The trial of Bill McVay, former city fireman, indicted for alleged connection with the death of A.L. Herring of St. Louis, who was shot to death at the Forest Part Zoo in that city on the night of Feb. 18, is docketed for Thursday in Judge R.B. Seay's court. The shooting of Herring is admitted to be a case of mistaken identity. McVay, confusing Herring with a man thought to have been with McVay's wife when later developments proved Herring to have been with another party. Trial of Bill McVay, charged by indictment with the murder of A.L. Herring at Forest Park Zoo on the night of Feb. 18, was passed until next term Thursday morning in Judge R.B. Seay's court. Although the continuance was asked by the defense, the only known eyewitness of the shooting of Herring was absent. This witness is the woman who was with Herring when he was killed. It is said that she is in St. Louis. A hearing on granting McVay bond is set for Friday morning before Judge Seay. Bill McVay, alleged jailbreaker, wanted in Dallas to answer an indictment in connection with the shooting of A.J. Herring a year ago, was arrested at the home of his sister on West Dallas pike Wednesday by Pat Richards and H.A. Hood of the Sheriff's department. It is charged that McVay broke jail in Fort Worth several months ago. Fort Worth Texas Sept. 20 - Four forgery and passing complaints were filled before Justice of the Peace J.W. McCain this morning. One of the complaints alleges that Bill McVay passed a forged check as C.M. Kitchin Sept. 7. This check, which called for $86.75, was drawn on the Southwest National Bank of Dallas. He was sent to jail following his failure to make bond in the sum of $1,500. more of article about others. It doesn't appear that he was ever convicted of the murder, even tho he confessed. I can't find anything else about him.